Plants to ca. 10 cm tall, irregularly branching. 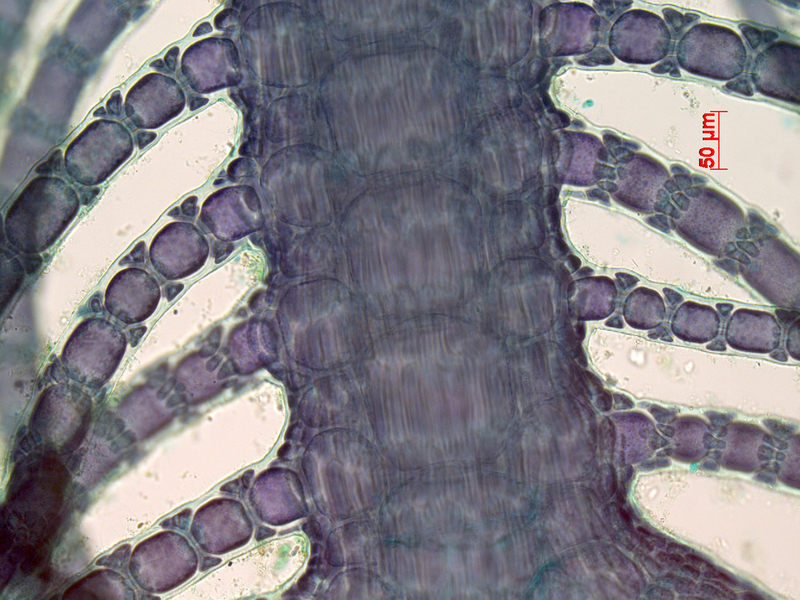 Thallus perfectly distichous, each segment with two opposite determinate ramuli. Segments of the main axis with about 10 periaxial cells, each producing two (the basal cells of the determinate laterals three) derivatives in basipetal direction, which make contact with the periaxial cells of the segment below. Secondary cortication starting very soon, obscuring the initial pattern. Indeterminate axis increasing to ca. 1 mm thickness. Determinate laterals slender, ca. 75 µm in diameter, up to 30 segments (= 1.5 mm) long. Segments of the determinate laterals becoming somewhat longer than broad, incompletely corticated; cortical bands at the most three cells high, the periaxial cells lying in the middle. 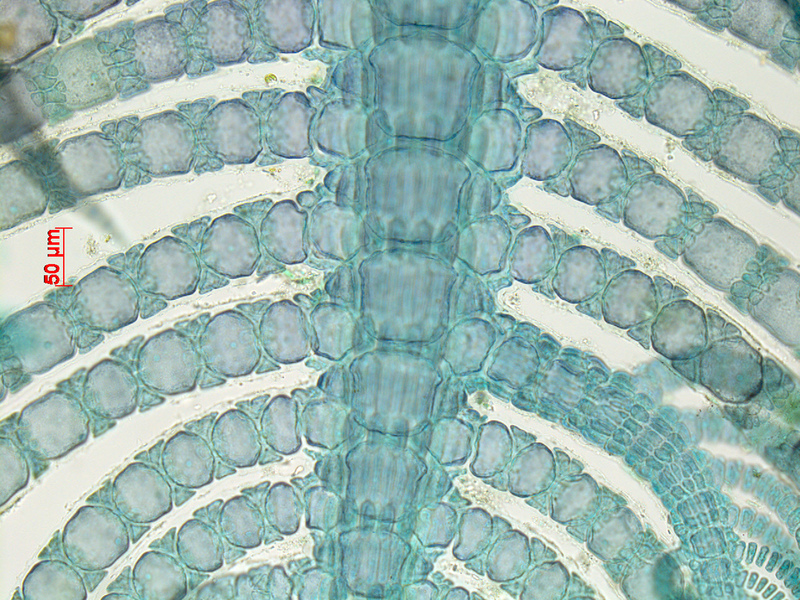 Determinate laterals tapering to a pointed cell. Reproductive stages not seen. Recorded between False Bay and Shelly Beach, southern KwaZulu-Natal (16-49). A rather rare species, found in rock pools and subtidally down to at least 19m (De Clerck et al. 2005). Type locality: mouth of Kowie River, Port Alfred, Eastern Cape Province, South Africa (Silva et al. 1996). Note: De Clerck et al. (2005) point out that this is the only South African Spyridia “lacking terminal spines on the determinate laterals and exhibiting an opposite branching pattern with two determinate branchlets being produced from a single segment”. Spyridia plumosa (KwaZulu-Natal, Photo Tom Schils). Spyridia plumosa thallus apex (Goukamma oyster beds, stained slide). Spyridia plumosa older main axis with determinate laterals (Goukamma oyster beds, stained slide). 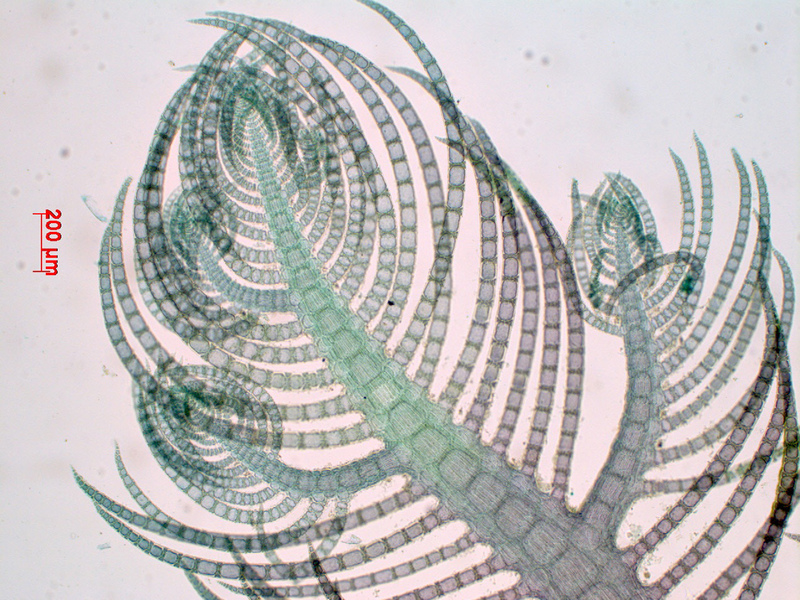 Spyridia plumosa older main axis with determinate laterals (stained slide). Agardh, J.G. 1897. Analecta algologica. Continuatio IV. Lunds Universitets Års-Skrift, Andra Afdelningen, Kongl. Fysiografiska Sällskapets i Lund Handlingar 33(9): 106, 2 plates. De Clerck, O, Tronchin, E. M., Schils, T. 2005. Red algae. In: De Clerck, O., J.J. Bolton, R. J. Anderson and E. Coppejans, 2005. 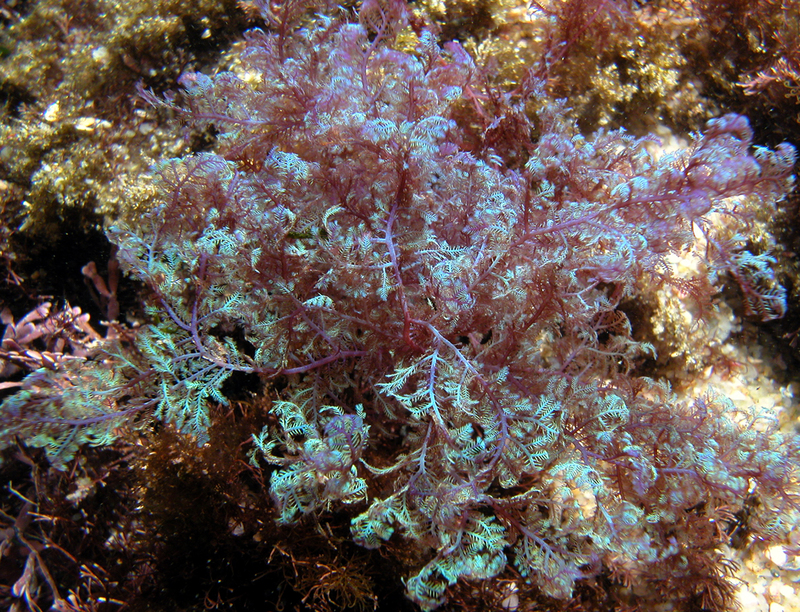 Guide to the Seaweeds of Kwazulu-Natal. National Botanic Garden of Belgium, Brussels (Scripta Botanica Belgica), pp. 130-269.